Psychological time is the instability of one's time awareness. It can be defined as the difference the clock makes with the sundial. It is as such a quantifiable variable open to behavioral research. In a wider context the term refers to the experience of timeless time or sacred time. Absorbed in activities or meditating, one tends to forget the time. Entangled in material activities one suffers the time. Thus there can be instability in one's timeawareness. The instability of ones psychological experience of time which results in the psychic trouble of having symptoms of neurotic uncertainty and compensation as found in the being entangled, are attributable to the cultural framework of materialist society that manipulative with time makes for an estrangement of time resulting in cultural friction or system stress. The cure for the negative of psychological time is found in the cakra-order and the filognosy belonging to it which restores one's natural consciousness. The vedic equivalents are ahaitukam, kalâkuta, halahala en asatkâla. 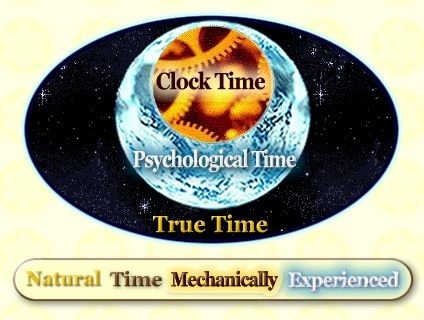 Time: psychological time can be recognized as the product of the negative relationship, the difference, between clock-time and natural time. The Order of Time Platform for the science, spirituality and personal of an alternative time consciousness.